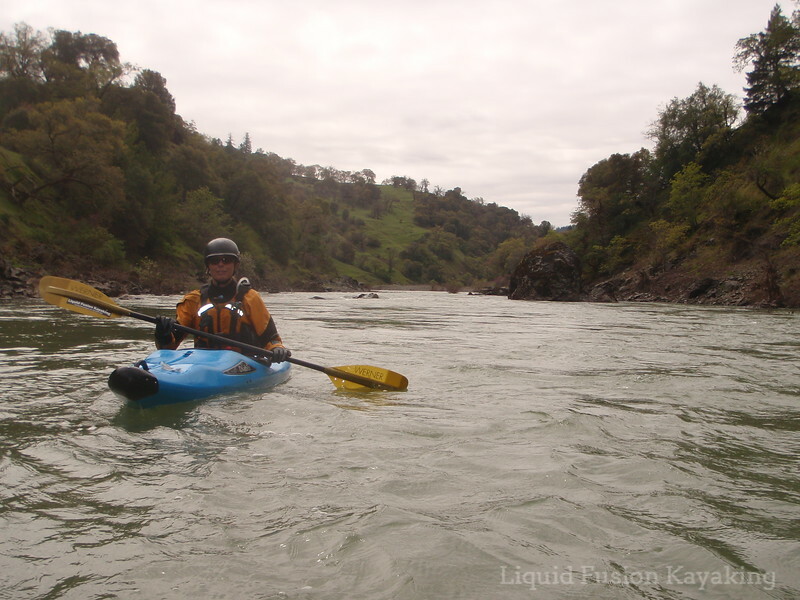 On Day 3 of our Eel River trip, we woke to overcast skies. As we packed up, it started to drizzle. 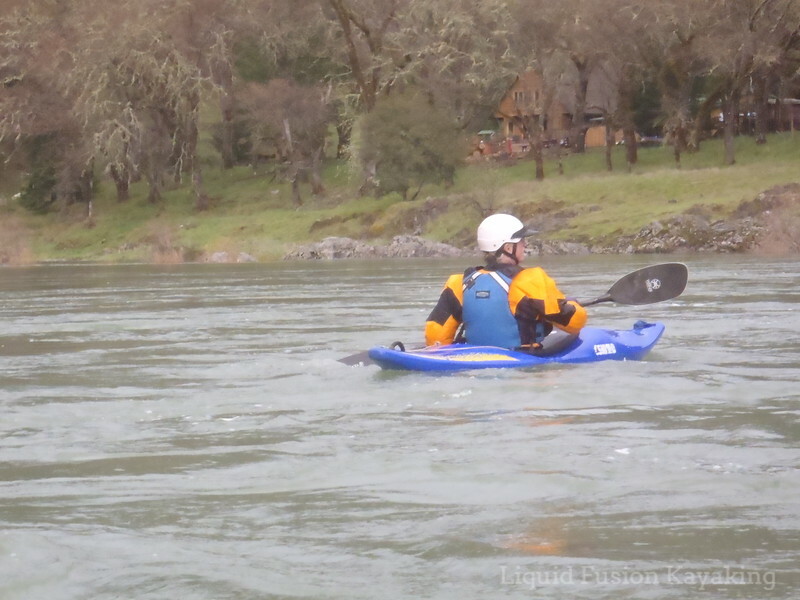 We put on the river with the goal of getting to below the middle fork confluence - about 16 miles down river. Overcast skies aren't the best for photos. The miles sped by quickly. We stopped for a quick snack at the confluence of Outlet Creek. 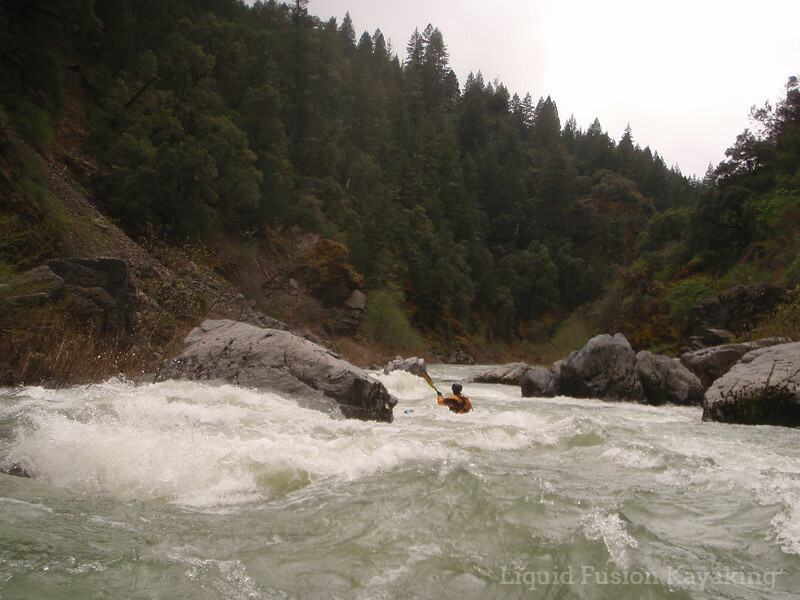 The 7 mile stretch on the Eel from Outlet Creek to Dos Rios is one of our favorite whitewater runs and one that we know quite well. We didn't stop and play at our usual waves because we were excited to get into new territory for us below Dos Rios. The river was flowing really fast. It took less than an hour to run the 7 mile stretch. Confluence of Main Fork Eel and Middle Fork Eel at Dos Rios. 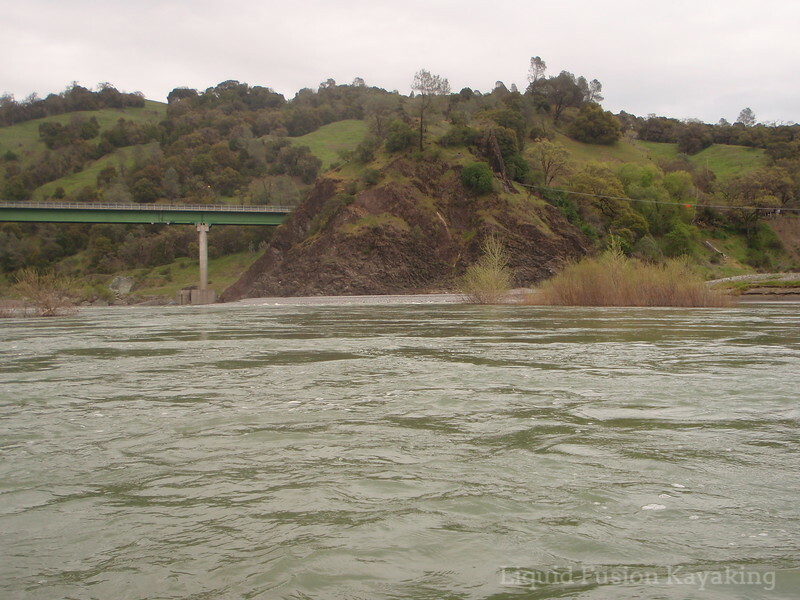 At Dos Rios, the Middle Fork of the Eel joined the main river and added even more flow. 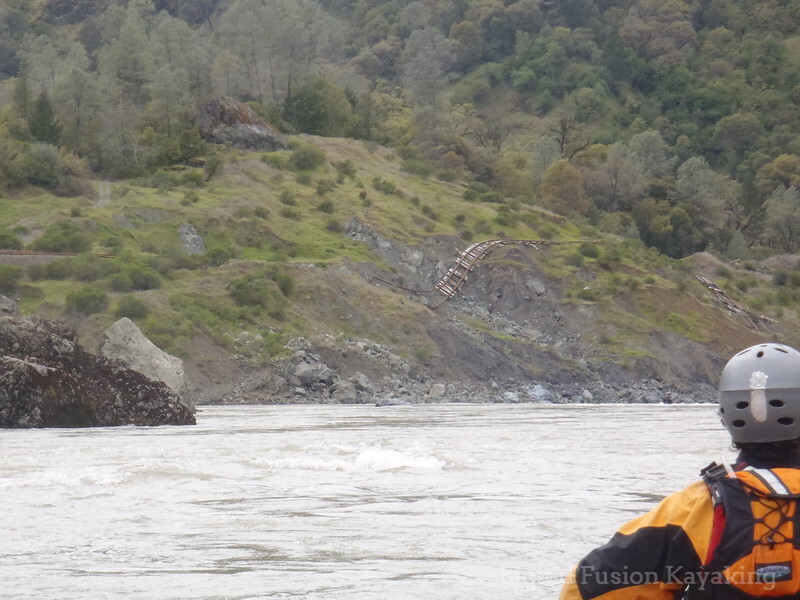 We estimated the flow of the river to be about 10,000 cfs (cubic feet per second). It was moving really FAST!!! We were watching for a specific campsite on the river but zipped by it and had to improvise. 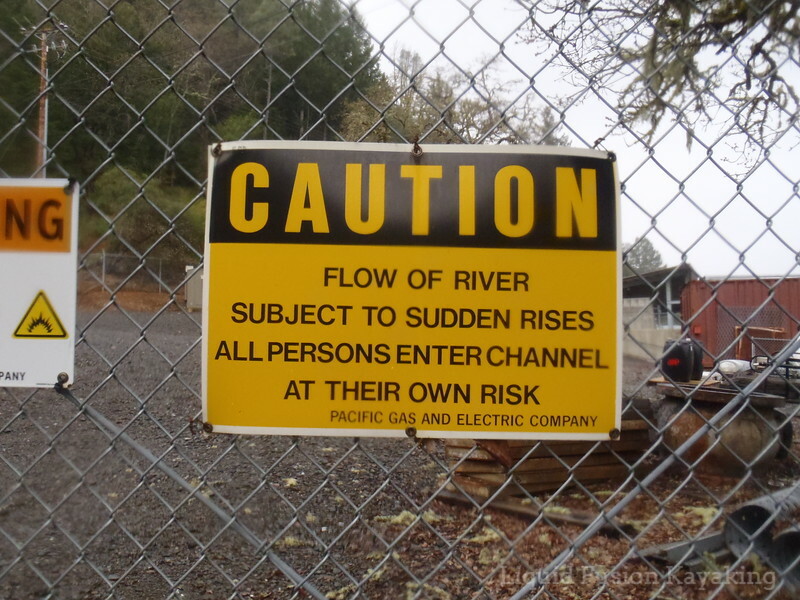 Signs of the abandoned Eel River Railroad. Below Dos Rios, our trip once again became wilderness. The old railroad tracks paralleled the river, but there are very few roads into or out of many stretches of the Eel River. Occasionally we would see homes in the mountains, but many appeared to be unoccupied. We pretty much had the river and wilderness to ourselves - well not exactly. Bear tracks by our kayaks. 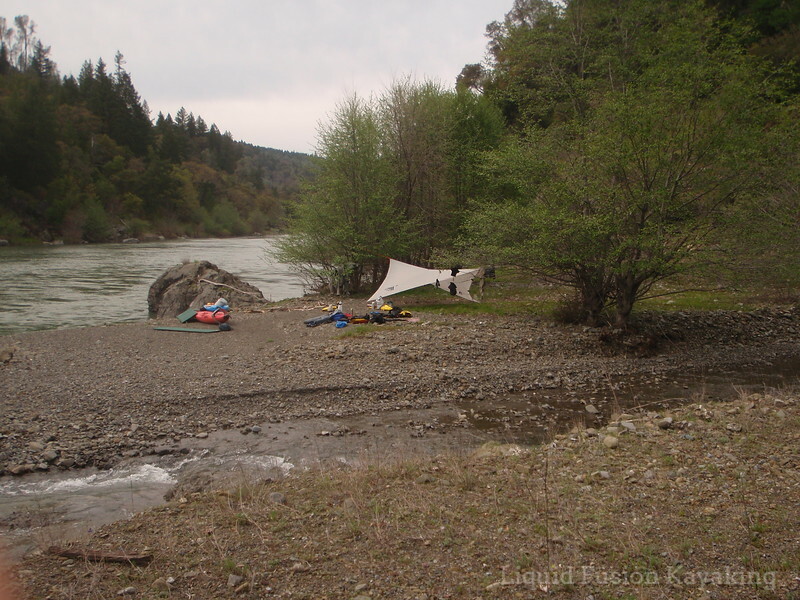 When we were scouting a riverside campsite for the evening, we landed our boats on a sandy beach and walked 100 yards down river to check out a creek for water and camping. 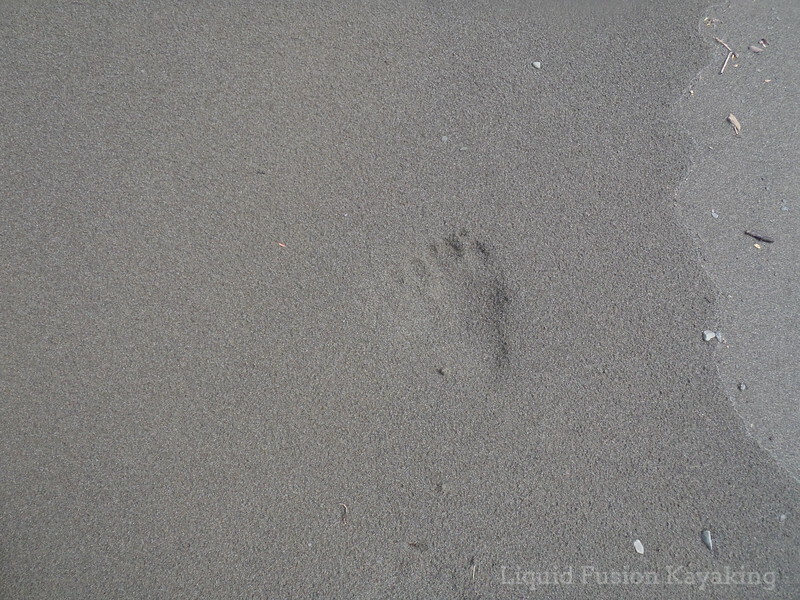 When we returned to our boats, there were bear tracks in the sand right by our boats. The tracks weren't there when we landed. It gave us pause for a moment. Fortunately these wild California black bears don’t associate humans with food. Regardless, we didn’t store food in our camp. We were a little weary from the long day and missing our campsite destination. Not too long after we set up camp, Jeff went to bed. We called this campsite - Camp Cranky Pants. I have to admit that I am not really into fishing - I like catching and eating. Rock cod season opened on the Mendocino Coast May 1. This week we finally got the conditions and time to get our lines wet. We decide to fish one of our usual spots. The lack of kelp is concerning, and we weren't sure if there would be any fish to catch. 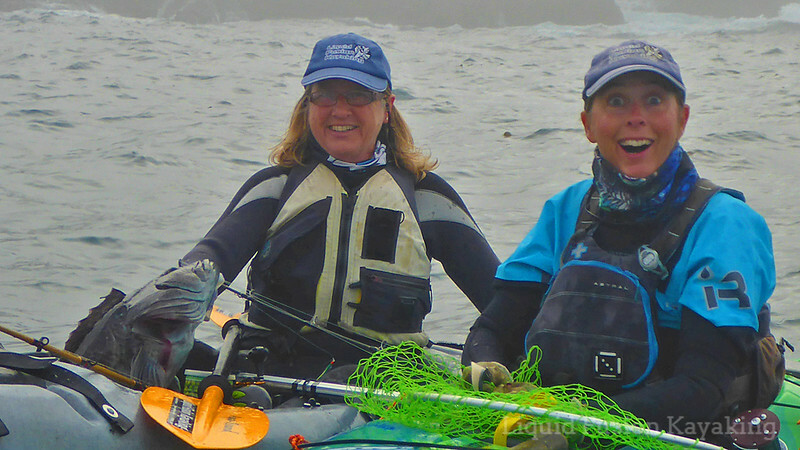 As soon as we kayak past the first guardian rocks of the bay, we drop our lines. Almost immediately, I feel that exciting tug on my line. "Fish-on!" Then that tug becomes a pull and I am fighting to keep this guy from heading into the rocks. (When hooked, rock fish like lingcod will try to escape into the underwater rocks.) We battle as he tries to escape and I try to reel him in. He pulls and I pull. I gain some ground and reel. Then he dives, the drag on my reel gives a little and my pole flexes a lot. It holds and he is still on there. The fight continues - pulling and reeling, pulling and reeling. Once I get him out of the rocks into open water, things relax a little. I slowly work him closer to the surface. The water is fairly clear and as he gets closer I can see him. He is a big one!!! I've got a lingzilla on the line! A lingcod has to be at least 22 inches long to keep. 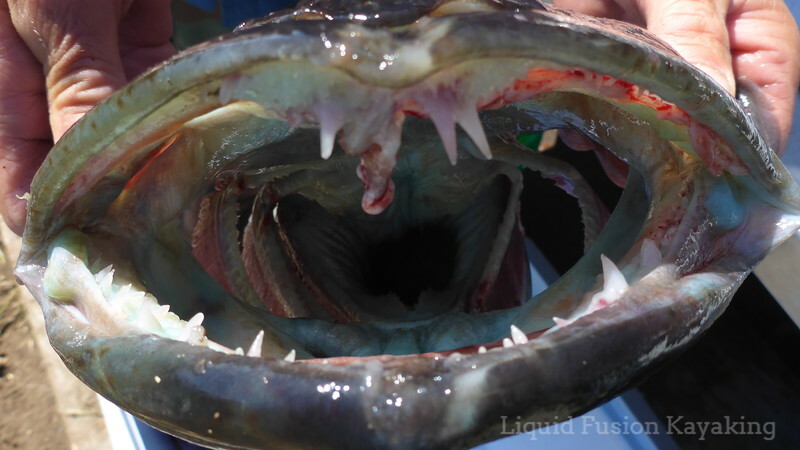 In our world of amateur kayak fishing, any fish over 30 inches that fights and has big teeth is termed a lingzilla. I call my friend over to be ready to help. For us fishing for rock fish is like rock gardening - a team sport. We usually fish close to the rocks and have the skill and comfort to be there; however, it is nice to have a teammate there to help out if needed. Today, the drift is into the rocks. As I am battling my fish, I am getting pushed closer into the rocks which have waves washing into and over them. With our rock gardening experience, we are quite comfortable being close to rocks with breaking waves. Getting washed into the rocks with a fish on the line is a bit harrowing. With my friend handy to keep me off the rocks, the moment of truth is here. Can I get him into my net? 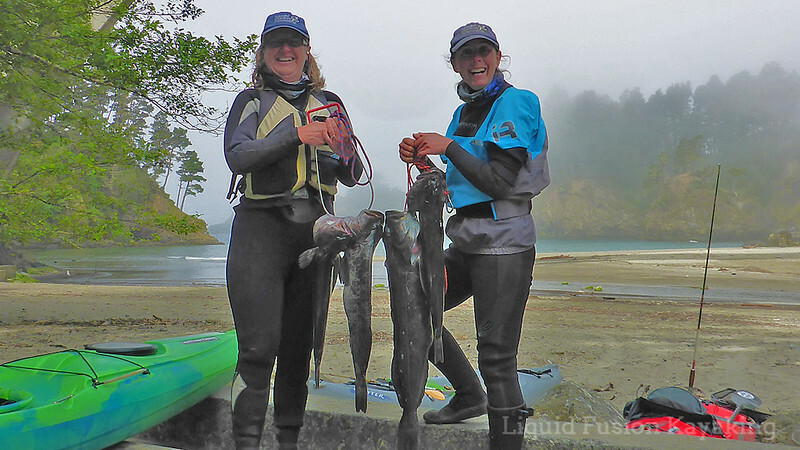 When fishing for lingcod, keeping them from escaping into the rocks is the first battle. The next is netting them. As soon as you pull them above the surface of the water, they fight like crazy. 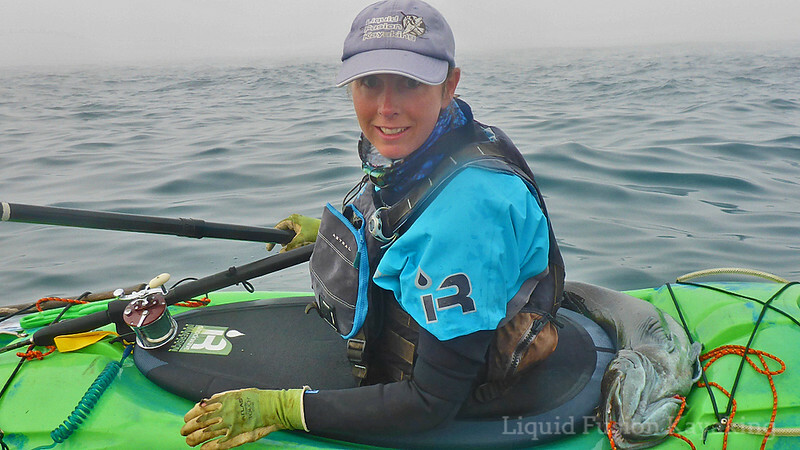 When we first started kayak fishing for lingcod, we lost quite a few. I slow down and keep him just below the surface as I ready my net. I rehearse the timing and sequence in my mind. And here we go! As he breaks the surface, he thrashes about like mad. He is really heavy. I bumble a bit with the net and lower him back into the water to reset. I take a deep breath to try to quiet the pounding of my heart and to reset my nerves and coordinate the catch. Somehow I manage to land him in my net and get my fish grips on him. Once I have him on my fish grips, I know that I have him and can go through my process of getting him on my stringer. After I have my fish in the water on a stringer, I get ready to start fishing again Then the call of "SEA LION" comes. Sea lions are notorious for stealing fish off the line. I struggle to get my fish out of the water and onto my deck. With fish pulled in, we watch for the sea lion. We have our paddles ready if he comes too close. Fortunately he moves on, and we get to continue fishing. Before too long, we are catching fish again. The bite isn't hot but we are catching fish. Several are small so we quickly pull them in and set them free Eventually I catch another legal lingcod, my friend gets 2 and Jeff gets one. It is time to head in and prepare for the cleanup. Jeff prepares to throw this small lingcod back. We have plenty of fish for dinner, the freezer, and to share. Gail and Cate bringing home dinner. For the records my lingzilla of the day was 33 inches and gave over 10 pounds of meat. Definitely not the largest ling out there but a pretty nice catch. Day two, we loaded our kayaks. 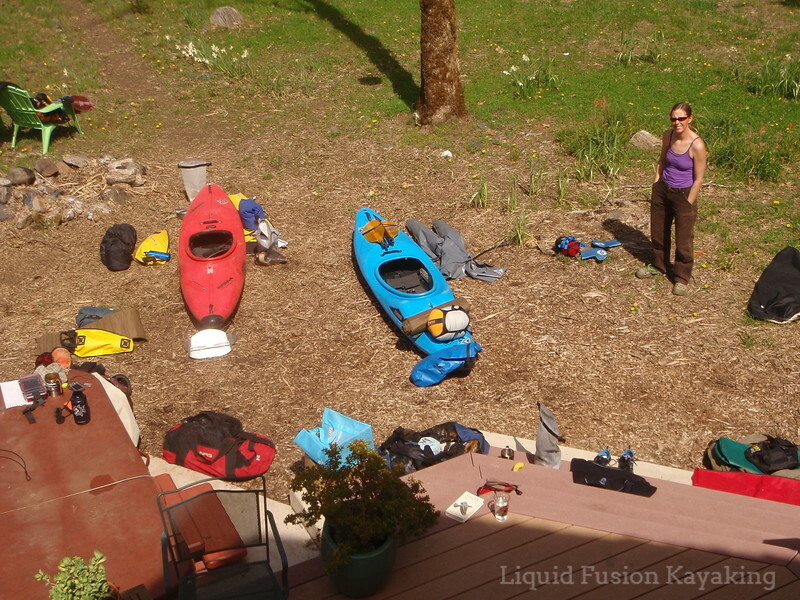 Packing food, clothes, and equipment to live out of a whitewater kayak for 8-10 days can be quite challenging. As we packed and repacked, what was truely essential was determined. Tent, sleeping bag, sleeping pad, tarp, stove, cook pot, water filter, spare paddle, and an extra set of warm clothes were determined to be the essentials. In any extra space, we squeezed in fresh fruit, beers, and tequila. As we launched on our second day, I realized that I had not packed my boat evenly and my boat was stern heavy. It felt like I was riding a wheelie down the river. Waves and boils seemed to be constantly grabbing my unbalanced boat and challenging my balance and bracing skills. At the top of the most difficult rapid of the day, a wave capsized me. As my kayak flipped upside down and my head dunked in the freezing cold water. With my kayak stuffed full of what we needed to live for the next week, I knew that I had to roll my kayak up right. With hundreds of rolls under my skirt, I went on autopilot and rolled my kayak upright. We did about 13 miles of the 17 mile Hearst Run on our second day. In my opinion, it is one of the most scenic stretches of the Eel River. 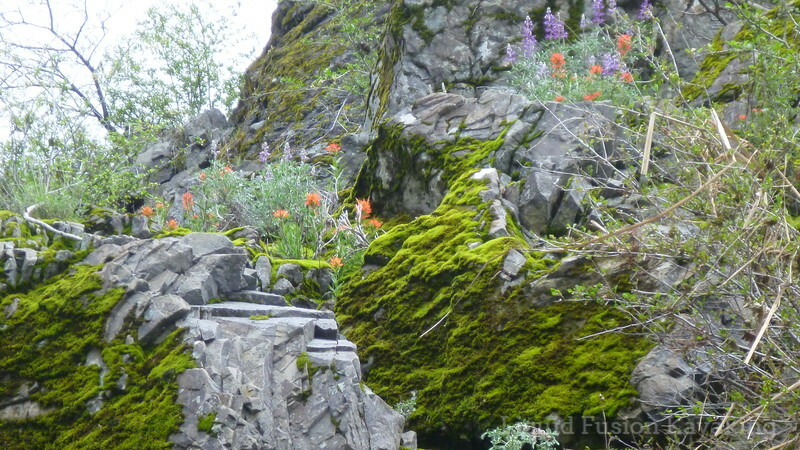 In the spring, wildflowers add color to the river banks and hillsides..
About a mile into the Hearst Run, the river constricts into a tight gorge. Ramsing Rapid aka Ramsing Corner is a class III rapid at the beginning of the gorge. 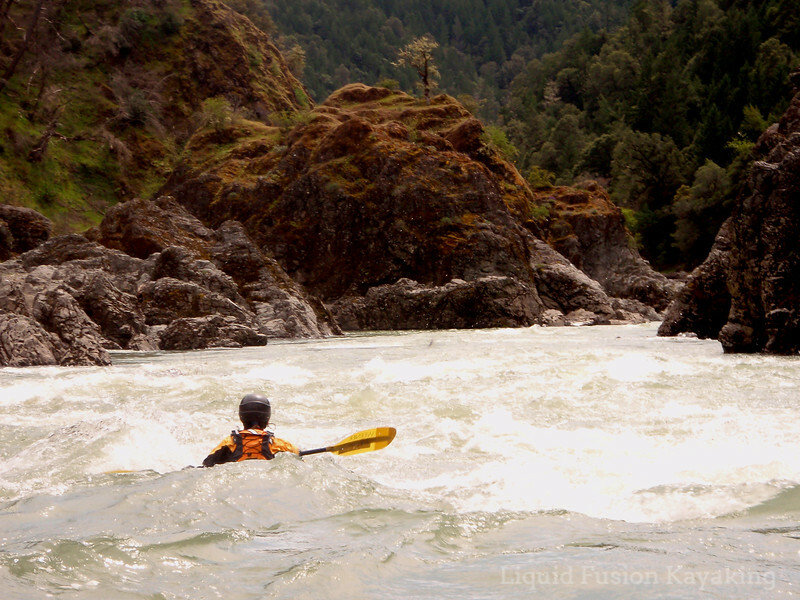 At high flows both Ramsing's Rapid and the gorge often challenge kayakers with whirlpools and boiling eddylines. The flow was pretty high on our trip (possibly 3,000 cfs). I have to admit that I was relieved when we emerged from the gorge. Other wildlife that we saw included river otters, deer, bald eagles, and a bear. We saw the bear when we were camped at Indian Creek. We had just finished dinner and were enjoying a couple of beers when the bear sauntered out from a cluster of rocks on the hillside just up river from us. He strolled along, hopped up on a log and bounced up and down on the log. He hopped off and continued on his way up the ridge seemingly unconcerned about us. This was a really nice day on the river. It was sunny and 60 degrees with little to no wind. 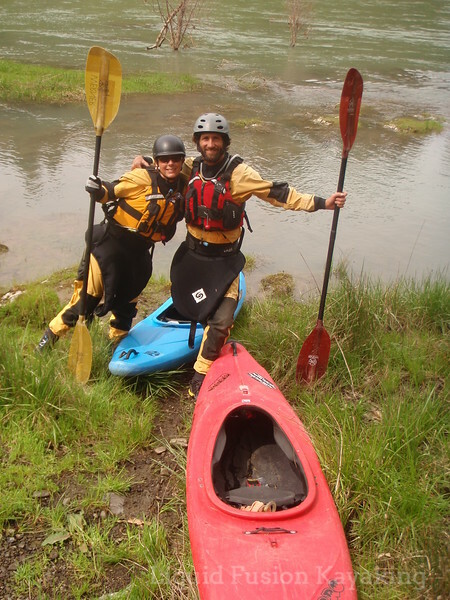 We managed to fit everything into our kayaks that we needed and the two of us were off on a wilderness kayaking adventure on the Eel River. 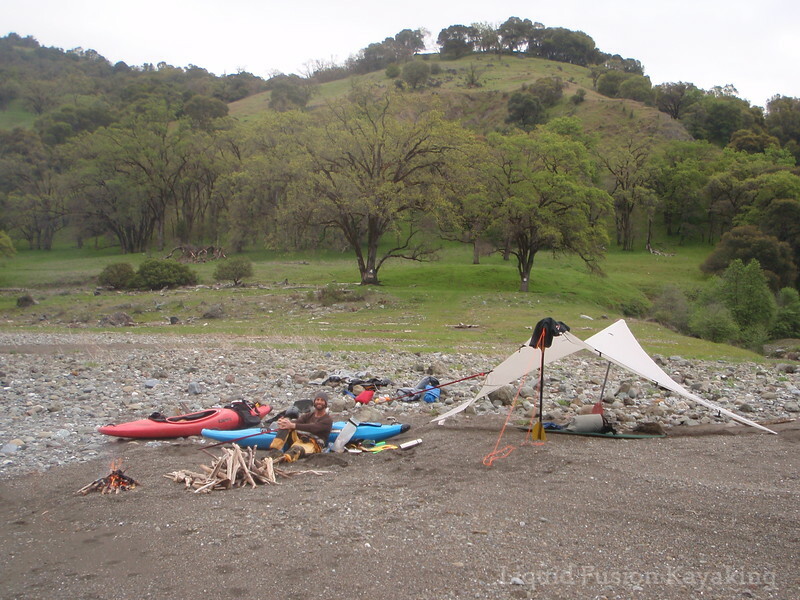 In 2011, I discovered that I love multi-day wilderness kayak camping trips - especially on the river. Fortunately Jeff shares this interest so each year we plan our vacation around a multi-day river kayak trip. This year, we were off to the John Day River in Oregon. Kayak camping trip on the John Day River. This year's idea to do the John Day started in October at Lumpy Waters. A highlight of Lumpy for me is getting to chat with paddlers from all over the Pacific Northwest and hear about their adventures. When I shared that Jeff and I really enjoyed our trip on Oregon's Owyhee River in the spring, others said that we had to do the John Day River. Paddling into the Painted Hills on the John Day River. This spring when we started planning, I emailed with a couple of friends for some beta and ordered up the maps and river guide. We started planning logistics of how many days, where to put in take out, shuttle, and what to bring. Trip planning for the John Day River in Oregon. One of my favorite things about planning trips, is menu planning. Each trip, seems to get better. I enjoy creating my own back country meals. This year I had a couple of new dishes including spaghetti squash with spaghetti sauce and ham. I dehydrated the spaghetti squash, sauce, and ham separately then combined them when preparing the meal in camp. It was yummy!!! Another new meal for this trip was my own spin on the Dirty Gourmet's Thai Coconut Soup. I also started making my own egg dishes for breakfast with OvaEasy powered eggs. They are actually quite good - especially when combined with other goodies to make breakfast burritos. For snacks, I had chocolate, trail mix, beef jerky, and of course Huppy Bars. The snack bag with yummy Huppy Bars. I packed 10 days worth of food into 5 dry bags which weighed in at 24.5 pounds. This was not counting the apples, cheese, vegetables, and beverages that we also packed with us in our kayaks. 24.5 pounds of food for 10 days. The environment of many rivers is sensitive and to minimize human impact, river users are required to pack out human waste. Our plan for river trips is, I pack it in and Jeff packs it out. For packing out waste, Jeff made a PVC poop tube that is similar to what RV's use in their pumping system. We call the tube "Kevin." 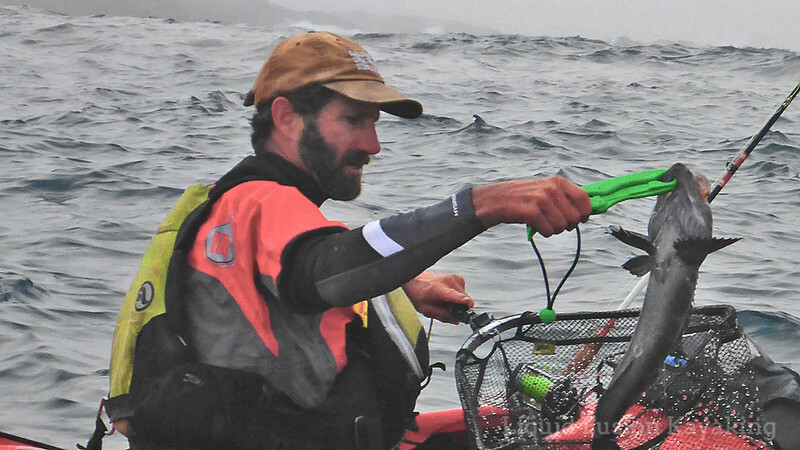 "Kevin" is the PVC poop tube on the back of Jeff's kayak. One of my favorite parts of exploring a new river system is researching the wildlife, flora/fauna, geology, and history of the area. I download pdf's, books, and aps onto my Ipad mini to use during the trip. On our way to the river, Jeff and I stopped by the Thomas Condon Paleontology Center to learn more about the geological history of the area. Contemplating the geology of Sheep Rock Mountain from the Thomas Condon Paleontology Center. The John Day River is a tributary of the Columbia River in North Central Oregon. It flows through the John Day Fossil Beds National Monument. The area has a rich volcanic history as well as one of the most complete fossil records in the world. It is fun to imagine the millions of years of volcanic events and extreme climate changes that have been recorded in the rocks and fossils. Interpretive exhibit in the Thomas Condon Paleontology Center. After lots of nerding out, Jeff and I did head to the river. We enjoyed 118 miles and 9 days and nights of kayaking and camping on the river. We knew that we would have a bit of flat water and potentially windy paddling conditions so we opted to take our Dagger Stratos sea kayaks for the trip. They are faster and more efficient than our whitewater kayaks, would be fun on the class II and class III rapids, and can haul enough gear for 10 days. Packing the Dagger Stratos for 10 days on the John Day River. The weather on our trip was quite variable. Rain and cool temperatures were forecasted (lows in the lower 30's and highs in the 50's) which necessitated packing rain gear and warm clothing. We managed to fit it all in as well as some tasty beverages. Packing food and necessities for 10 days into our kayaks. We were glad for the rain gear and warm clothes. There was frost the first night. Frost on our kayaks in the morning. The scenery of the trip was amazing and diverse. We traveled through valleys with towering mesas, steep cliffs of columnar basalt and painted hills. Dramatic scenery on the John Day River. The painted hills on the John Day River. Jeff checks out a wall of columnar basalt. During the first 48 miles from Service Creek to Clarno, we saw a couple of other groups on the river including a boy scout troop. A group of boy scouts enjoying a sunny day on the John Day River. On the 70 mile stretch from Clarno to Cottonwood, we didn't see anyone else on the river - humans that is. Wildlife highlights were sightings of bald and golden eagles, big horn sheep, and a bobcat. At one of our layover camps, we got to watch a flock of big horn sheep with lambs grazing on the cliffs above us. Bighorn sheep and lambs on the cliffs above our camp. At another camp, we watched a Canada Goose tend to her goslings on a cliff about 15 feet above the river. As we were loading our boats to leave the next day, she flew off the cliff and called the goslings down into an eddy below the cliffs. We watched the goslings tumble down the cliff and into the fast moving current. 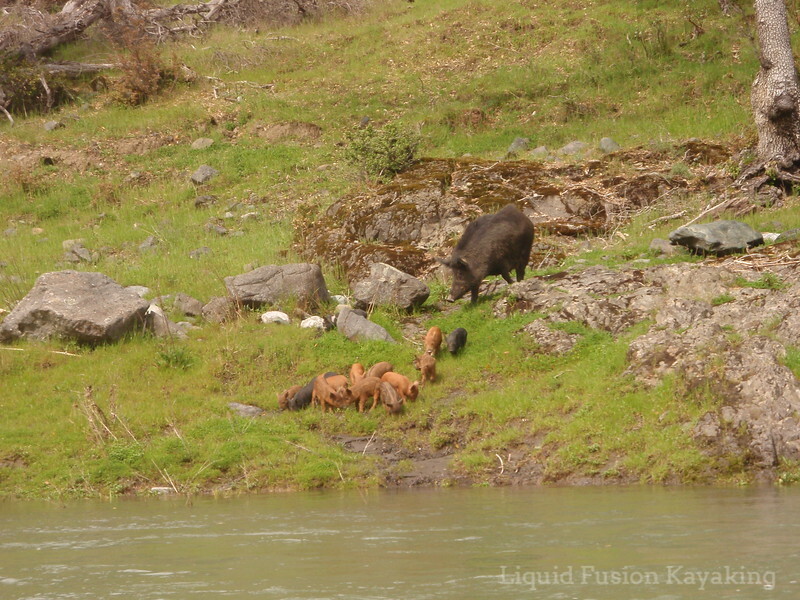 The parents then guided them out of the bottom of the eddy and into the main current and down the river. Canada goose sits on her nest in the columnar basalt on the John Day River. Jeff came across a rattlesnake and a scorpion. Happily I did not come across these critters. On multiday kayak trips, we tend to have a random pace. We tend to do fewer miles on sunny warm days when we can enjoy time in camp - hiking, birding, and relaxing, On rainy days, we tend to do more miles. One of the most spectacular scenery days ended up being one of our rainy days. Our rainy day photos from Basalt Canyon and the Palisades hardly do the majesty and beauty of the river canyon justice. 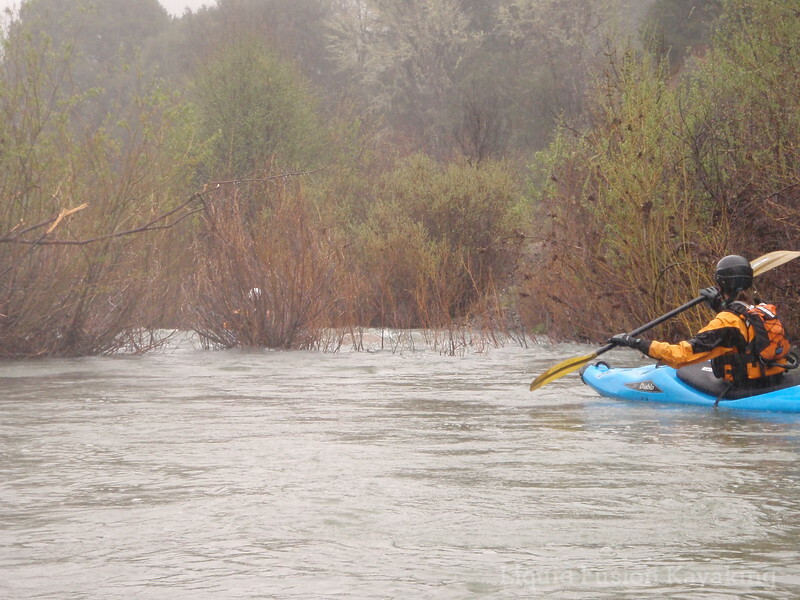 Rainy day paddling on the John Day River. The current was swift on the river. The swift current was fun in a loaded sea kayak. The handful of class II and III rapids kept things interesting. 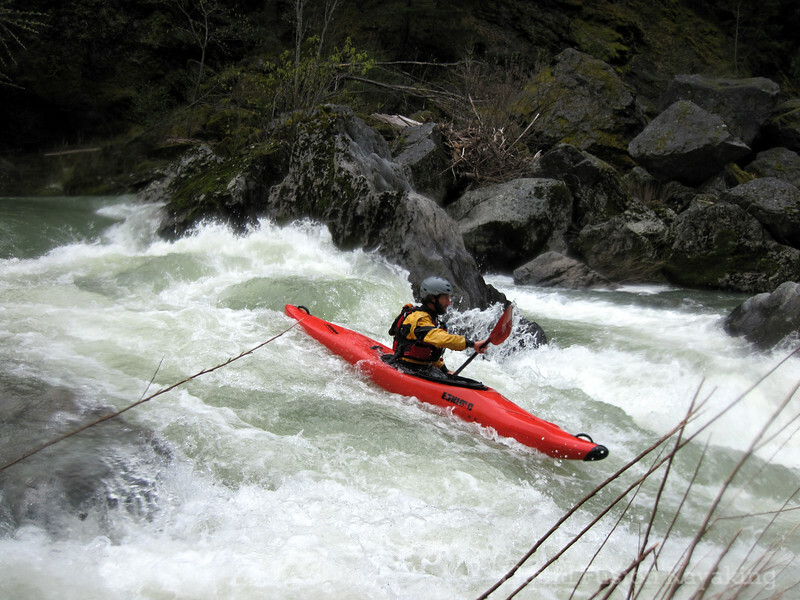 Cate enjoying some whitewater in her Dagger Stratos on the John Day River. 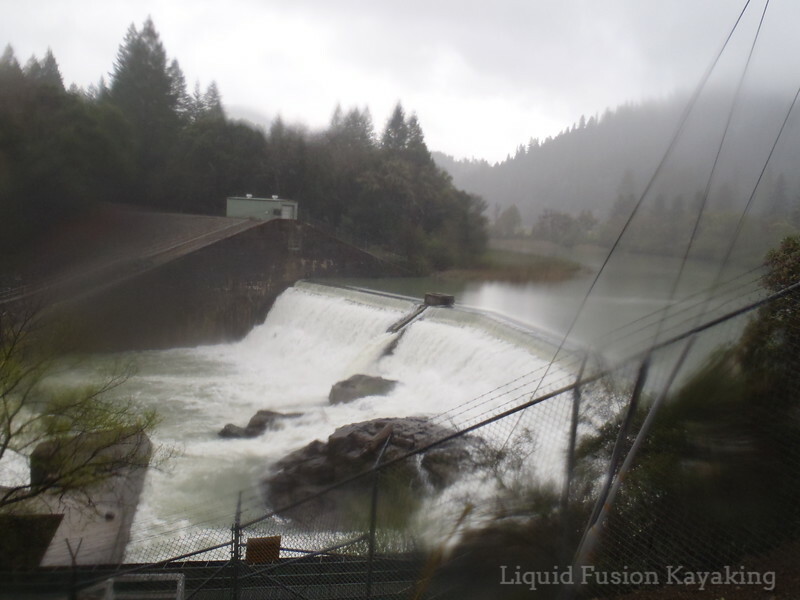 When we put on, the river was flowing at over 7,000 cubic feet per second. Rain during the trip increased it through out. When we took off the river, it was quite flooded and running at 12,500 cubic feet per second. On our last day of paddling we calculated that we were floating at 8 miles per hour. Zipping along on the flooded John Day River. The best part of kayak camping trips is connecting with the natural world. We keep the pace of our trips slow so that we can stop and admire the wildflowers, watch birds and wildlife, and daydream as clouds float by. Taking time to daydream and watch the clouds. Our 2017 Spring Run Off Trip on the John Day was excellent. We both enjoy going back and doing it again but are also looking forward to discovering a new river for our next kayak camping adventure. Beautiful evening kayak camping on the John Day River. 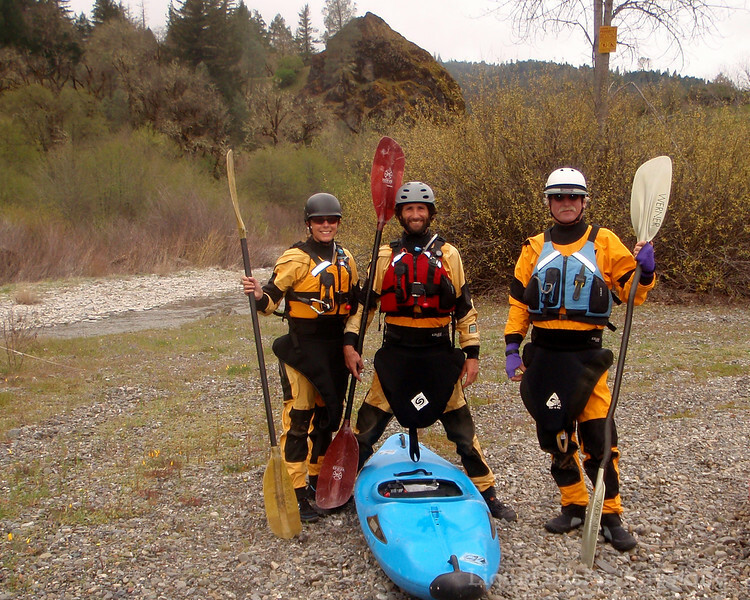 Our first day had some of the toughest whitewater of our trip and was one of the longest paddling days. Jerry joined us for day one as we paddled 25 miles from Pillsbury to Hearst. A little bit of rain triggered snow melt. 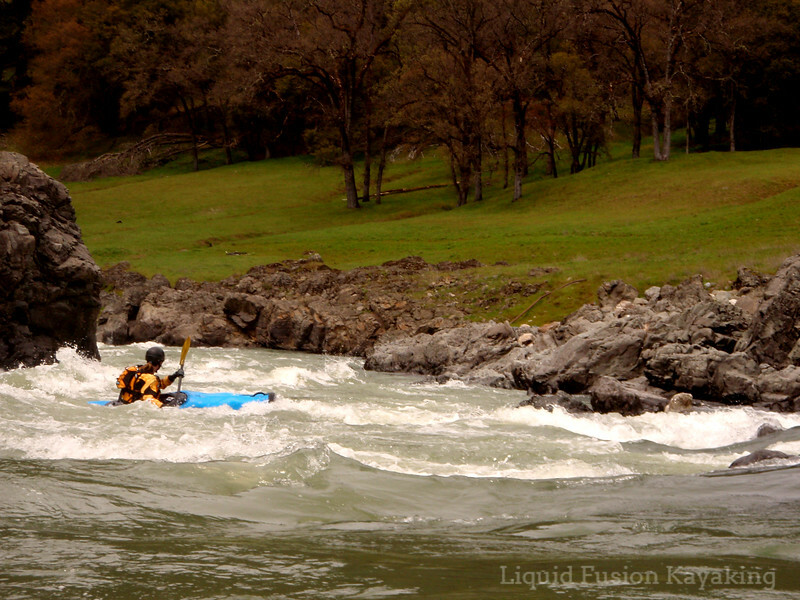 The flow of the river increased from a slow and shallow 350 cfs (cubic feet per second) to a fast and technical 1500 cfs. At this flow some of the rapids were in the Class IV range. As a progressing whitewater kayaker, this run was the most technical whitewater that I had yet to paddle and a good test of my developing skills. 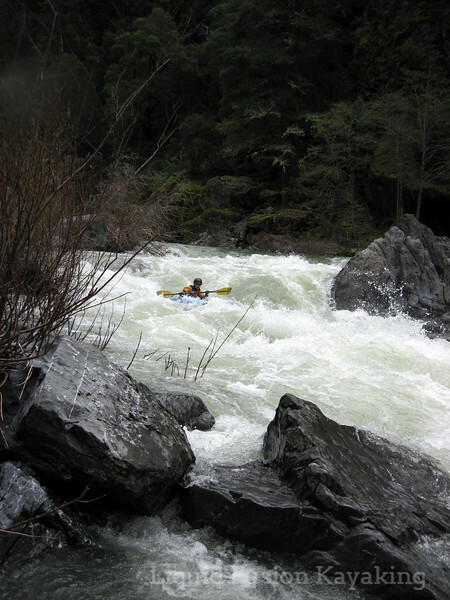 The rapids were fast and furious with powerful hydraulics to avoid while maneuvering through tight boulder strewn channels. 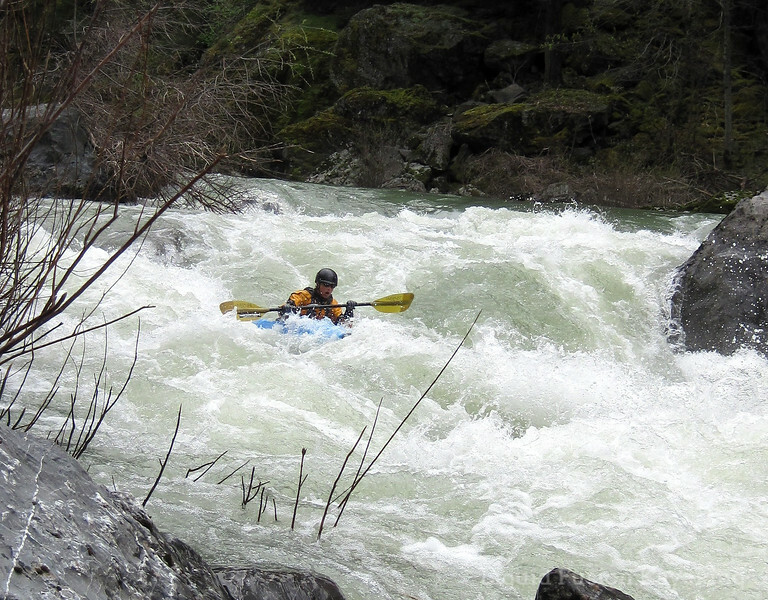 A rapid called Double Drop was one of the most significant rapids of the day. It was a bend in the river with an elevation drop where the water was funneled between gigantic boulders. At lower flows the rapid presents 2 distinct consecutive drops. As we scouted it from shore, the 2 drops were not distinct. They appeared to have merged into a huge frothing channel of chaotic whitewater with diagonal, lateral and reversal currents. Jeff ran the rapid first and hit a clean line. Back in my boat at the top of the rapid, I felt surprisingly calm. However, as I committed to dropping into the frothing madness of the rapid, my heart was in my throat. Time was suspended for a moment and the mantra “Lean forward and paddle” came to mind. 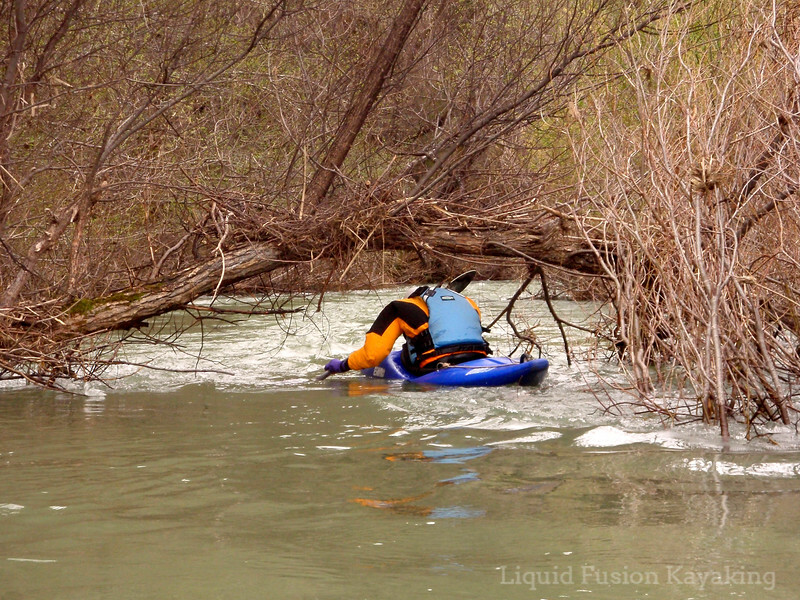 I dug my paddle blade into the water and launched into the mayhem of whitewater. Plunging into the rapid, my boat buried but resurfaced. I powered forward timing my paddle strokes with the waves to stay upright. I dropped cleanly down the line and eddied-out in the calm water below the rapid. Feelings of elation and relief were overwhelming as I looked up at the walls of foaming whitewater that I had just descended. Double Drop was the biggest rapid of the long 25 miles that we ran. The portage around Van Arsdale Dam was not particularly fun but was a piece of cake compared to negotiating the maze of willows and strainers below the dam. I think that negotiating the willows was more stressful and potentially dangerous than the rapids that we ran on the Pillsbury stretch. It rained on us most of the day and the river continued to rise. This was a blessing on many of the flat stretches below Van Arsdale and also promised that we would have a swift water journey as we paddled to the sea. At the end of the day, we were happy to reach Jerry's chalet on the Eel River for a warm meal, shower and dry bed. Paddling into the Albright Chalet on the river. Photo by Jeff Laxier. The next day, we would be loading our boats and heading down river for the rest of the adventure.